It might just be because this photo is so grainy, but it’s very dreamy-looking — a sort of soft-focus view of Dallas’ sophisticated nighttime skyline. The photo is credited to the Dallas Chamber of Commerce. I’m pretty sure this came from a high school yearbook, but I’m afraid I neglected to note which one. This, I do love! I remember Dallas so well from that era. Every single year on the family summer car vacation, we would drive by, usually at night, and I was all eyes O.O looking at the city. My, how Dallas has grown since then. Absolutely and easily, in my opinion, the prettiest night skyline in the whole country. Definitely a finalist worldwide. It may be just my green roots showing but still, no one can argue that it sparkles like a pirate’s treasure these days. 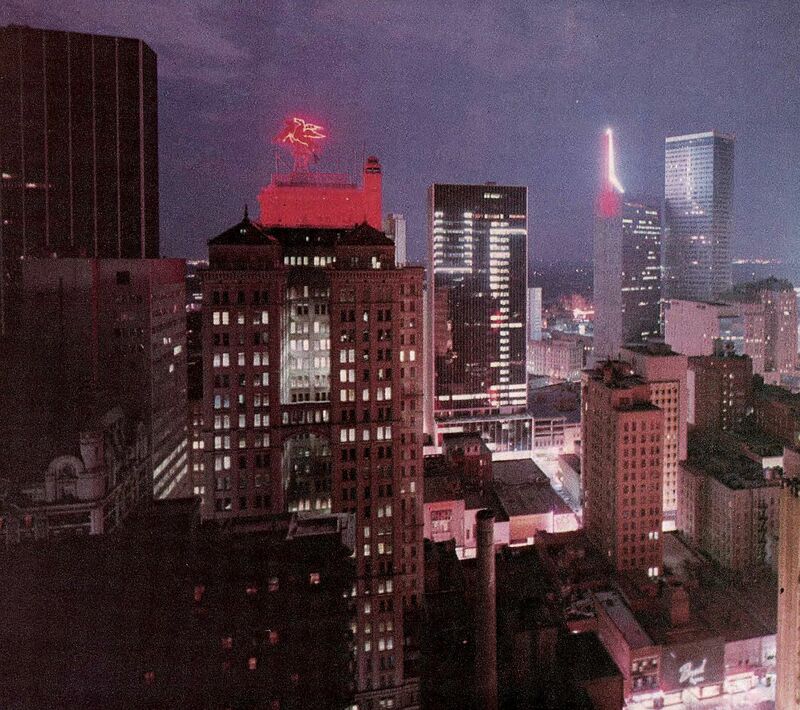 EDIT: Per Jeff’s comment below, the Southland Life Building is not in this photo — it is actually the Republic Bank Tower II. 1.) You can see the top floors of the Baker Hotel in the foreground in the bottom left corner. This where the Whitacre Tower (1 AT&T Plaza) now stands. 2.) Just to the left of the Magnolia Building and beyond the Baker, you can see the roof of the Adolphus Hotel. 3.) To the right of the Magnolia Building, I think, is the old Dallas National Bank Building (now the Joule Hotel). In between it and the LTV tower is Stone St (Stone Pl). 4.) To the right of the LTV tower is Republic Center 1 and 2 towers. You can’t see the Southland Life Building in this photo. The streets are as follows, starting at the bottom of the picture: Commerce (between the Baker and the Magnolia), Main (on the other side of the Magnolia), Elm (in front of the LTV tower), Pacific (behind LTV and in front of the two Republic towers). Yes! I thought the Southland Life Building seemed too far away! Thanks, Jeff! I wondered why 1401 Elm is dark in this photo. Then I saw that it was completed in 1965, so I wonder if it hadn’t yet ever turned on its lights.